Both Web 1.0 and Web 2.0 were linked directly to new stages in the development of e-business. Whereas the distinction between Web 1.0 and Web 2.0 became widely accepted in literature and practice, we are merely at the beginning of the possibilities arising from current trends culminating in our information society. Information emerges increasingly as a major factor of production, allowing the activation of innovative business opportunities. However, over the past years, a sheer explosion of supplies has taken place. This development is both a blessing and a curse as it leads to an oversupply of information within the World Wide Web. Thus, the time needed for finding required information may take longer eventually. Therefore, a next generation technology is needed being capable to cope with these challenges. Due to the logic of this chain of ideas, Web 3.0 technologies are characterized particularly by demand-orientated systems, i.e. demand for objects and services are at the centre. Starting point are demand-driven registration and specification systems. The consumer is at the centre of these processes and will gain individual help, comparable to an information desk. Not only information but also individual products and services may be released (customized products). Against the background of an increasing information overload, the question to be asked is how technological and market-oriented future developments will cope with these challenges. This chapter aims at clarifying this overall development with the objective of giving impulses for the 3rd generation of e-business. For this purpose, the characteristics of each generation (Web 1.0, Web 2.0, and Web 3.0) are clearly highlighted. Internal and external information and communication processes at enterprises across almost every industry sector have been increasingly supported by electronic information technologies. The constant and rapid development of technology in the accompanying Net Economy has inevitably had a signiﬁcant inﬂuence on various possibilities for developing innovative business concepts based on electronic information and communication networks and realizing these by establishing a new company (e-ventures). Above all, internet-related technologies have produced new possibilities with respect to how enterprises create value for their customers. By offering physical and digital products and services via the World Wide Web, customer value are no longer be created on a physical level only, but also on an electronic level (Weiber, & Kollmann, 1998; Amit, & Zott, 2001; Lumpkin, & Dess, 2004). In fact, an entirely new business dimension which may be referred to as the Net Economy has emerged (Matlay, 2004; Kollmann, 2006) significantly influencing on various possibilities for developing innovative business concepts and realizing these by establishing entrepreneurial ventures that generate revenue and profits independent from a physical value chain. 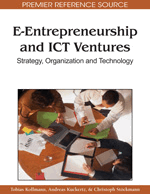 Against this background, the term ‘e-entrepreneurship’ was established (Matlay, 2004). E-entrepreneurship refers to establishing a new company with an innovative business idea within the Net Economy, which, using an electronic platform in data networks, offers its products and/or services based upon a purely electronic creation of value. Essentially, this value offer was only made possible through the development of information technology (Kollmann, 2006). Directly linked to these new stages of e-business is the development Web 1.0 and Web 2.0. However, over the past years, a sheer explosion of supplies has taken place. This development is both a blessing and a curse as it leads to an oversupply of information within the World Wide Web. Thus, the time needed for finding required information may take longer eventually. Therefore, a next generation technology is needed being capable to cope with these challenges. Due to the logic of this chain of ideas, Web 3.0 technologies are characterized particularly by demand-orientated systems, i.e. demand for objects and services are at the centre. Starting point are demand-driven registration and specification systems. The consumer is at the centre of these processes and will gain individual help, comparable to an information desk. Not only information but also individual products and services may be released (customized products). Against this background, we proceed this article with highlighting the development from Web 1.0 to Web 3.0, pointing out business opportunities for each phase.